In years past, we've made our own Christmas cards, but this year we decided to let the fine fine folks at Walgreens do the work for us. While it certainly isn't our most clever card, it is kind of cute. Although I'm not sure if the people on our mailing list really want three pictures of us in Hawaii. I still have a few envelopes left to address but I doubt I'll get this task completed any time soon. 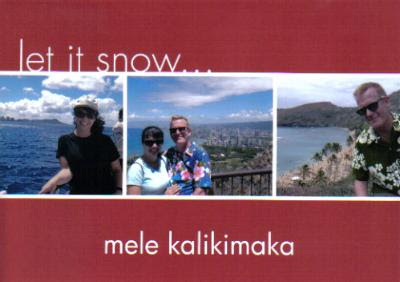 I can only hope the recipients think Mele Kalikimaka means "Happy New Year."